Pha Manyvong reaches quarter finals at 2017 Asian Open. 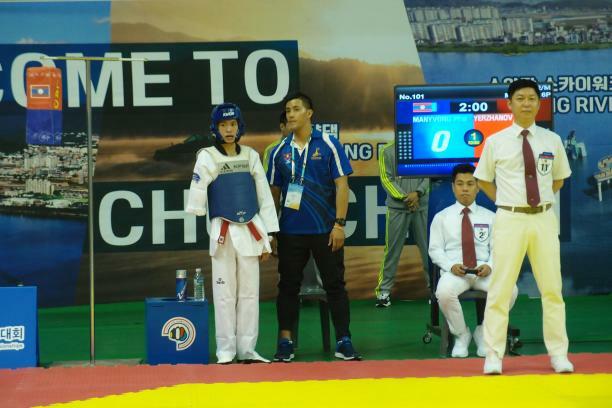 CHUNCHEON, Korea (July 19, 2017) – Laos’s Pha Manyvong has made a memorable debut at the 2017 Asian Para Taekwondo Open in Chuncheon, South Korea. “In the beginning of the match I was nervous. Once it kicked off, I enjoyed it very much,” he said of his first international fight. It was an historic moment for the country’s only fighter, who only took up the sport in April 2017. The 20-year-old from Vang Vieng had his right arm amputated above the elbow after falling from a tree at age five. He had always wanted to be an athlete, but he did not know in which sport. “I 100 per cent want to compete at the Tokyo 2020 Paralympic Games. I’ll continue to work out more with my hope of Paralympic debut,” he said. Manyvong’s debut in South Korea suggests he could well reach Tokyo in three years’ time. He defeated Kazakhstan’s Zhumagali Yerzhanov in the last 16 of the under 61kg K42 (13-1), before losing in the quarter final to Iran’s world No.1 Saeid Sadeghianpour. The Laos team was able to compete for the first time thanks to the WT’s 2017 Booyoung Para Taekwondo Development Program. “We are very happy and grateful to be here. 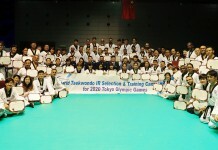 [We] appreciate the WT Para Taekwondo Department and the Laos Taekwondo Federation that helped us out very well,” Manyvong’s coach Vanthong Samlane explained. “I found Manyvong at a special education school. We started training together twice a week, after I decided to make a national team,” Samlane explained. 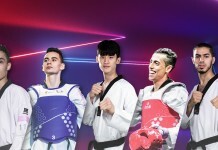 Samlane is hopeful that Manyvong can reach his Paralympic Games goal, despite there being no Para taekwondo events in his native Laos.